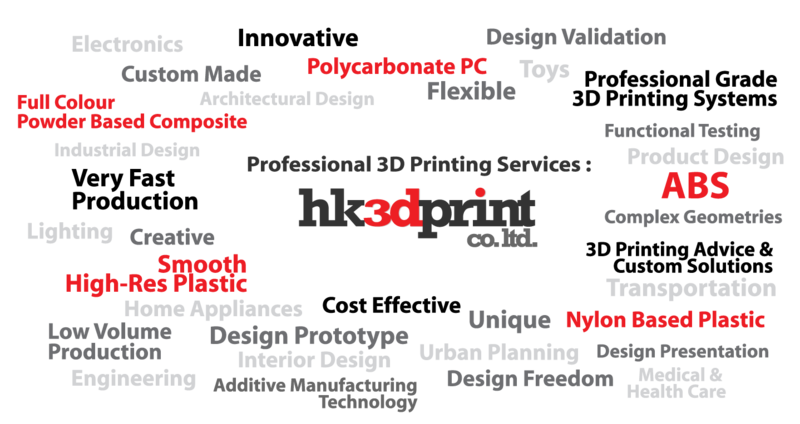 HK3DPrint Co. Ltd. - Professional 3D Printing Service in Hong Kong, offering 3D printing services with professional grade 3D printers and materials. We are committed to bring you the best quality for your 3D printed objects directly from 3D CAD files and work with the best and most cost effective 3D printing technologies. We offer expert 3D printing advice and custom solutions based on your specific requirements. Our 3D printing services also include 3D CAD file conversion, 3D CAD drawing production, 3D file checking & editing, post 3dprinting processing and finishing, timely and proper delivery and Oversea shipments, etc. Our professional grade 3D printing systems and production materials can save your company investment in expensive machinery and specialist labor. We offer a range of 3d printing material solutions for various applications including full colour powder based composite, production grade ABS and Polycarbonate, as well as coloured nylon, nylon plastic and smooth high resolution plastic materials.